Today is the celebration of your appearance in this world, and those of us who remember your kindness gather to glorify you and show how much we appreciate what you have done for us. Each of us in his own way benefited from your saintly association when you were among us: your disciples from your fatherly guidance on the spiritual path, your friends and well-wishers from your brotherly love and affection, and the fallen jivas from your learned talks on the Absolute Truth. I had the privilege to call you my friend. At least, you thought of me that way. The truth is that you were light-years ahead of me in Krsna consciousness, but you treated me as an equal and tried to raise me to your level. Such is the nature of saintly persons: they are non-envious and always concerned with the spiritual welfare of others. We were friends in the ultimate sense because we liked the same things. From the minute we met we were attracted to each other because we both relished speaking on the Bhagavatam and chanting and dancing in kirtana. We also liked the adventure of traveling and spreading Krsna consciousness. As young men we had a zest for taking prasada together. I was always amazed at your voracious appetite. But as I watched you relish prasada with gusto, I knew it was not just a question of taste but rather that you realized the prasada was the mercy of the Lord. And as preachers we always needed mercy to defeat our challengers. And perhaps the quality I most appreciate in you is that you were a fearless preacher. You had mastered the philosophy and did not tolerate any conclusion to the contrary. You would preach strongly and forcefully, not giving in to your opponents in any way. If they accepted defeat, you smiled and offered to help them on the blissful path of service to the Lord’s lotus feet. But woe to them who chose to argue with you! Your keen intelligence and witty remarks would soon reveal their foolishness and leave them no recourse but to withdraw. A preacher willingly accepts difficult situations in service to guru and Gauranga. He endures the rigors of traveling far and wide to preach the glories of the Lord. Sometimes he sleeps in a palace, sometimes on the side of the road. At times he tolerates the heat, and at other times the cold. Still, he remains satisfied from sharing the good fortune of Krsna consciousness, and you were not only satisfied but jolly through it all. In happiness and distress, honor and dishonor, even in the face of death itself, you were always the Jolly Swami. Today we honor and worship you for that endearing quality. Your merry nature and constant humor enabled us to tolerate the ups and downs of this world. You taught us to take material life lightly, that this world is a subject for jokes, not something to be taken seriously. We thank you for that. On the other hand, we thank you for helping us become serious in Krsna consciousness. 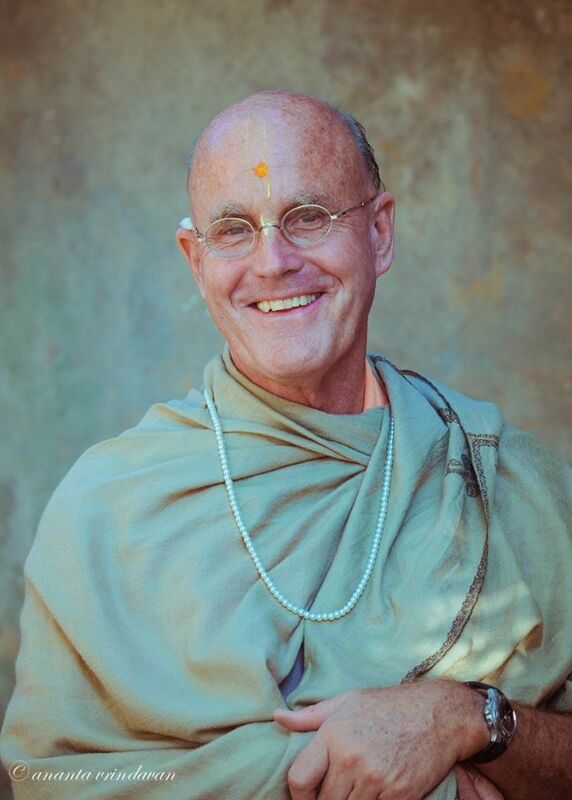 Your example as a sadhaka, a practitioner of Krsna consciousness, was exemplary. You always chanted your rounds and your Gayatri mantra. You faithfully attended morning programs, associated with your godbrothers and godsisters, and enthusiastically worshiped the deity. Just remembering you in this way gives us strength, even in your absence. We miss your dearly, Maharaja. The adage that time heals all wounds does not apply in the realm of devotional service. In fact, the contrary is true: as time goes on we miss you more and more. This is painful for those of us who love you. It is difficult to live without you and other godbrothers and godsisters who have left this world. Devotional service is relishable in the association of other devotees. As we grow older and devotees begin to depart, even devotional life seems devoid of happiness. The only remedy is to join all of you and Srila Prabhupada again, wherever your pastimes may be happening. In the meantime we will continue our services here in a mood of separation. I believe it is these feelings of separation that will bring us together again, because in the end one goes to where the heart takes one. Because you endeared yourself to me with your brotherly love, you are forever in my heart. Thus I am confident that one day I will again enjoy a good laugh with you in Krsna consciousness, and perhaps a good fight too, as we defeat our opponents somewhere in some universe in service to Lord Caitanya.